This book and course provides narratives, counter-narratives, academic research, and activities to better understand the Art of Story-Listening in theory and practice. The selected voices are former students, colleagues, and professors who share their stories and lessons on inclusion. PUR: 501 Finding Your Purpose. ​Learn to identify your purpose, passion, and connect your talent to a community in need. PUR: 503 Nonprofit Fundraising 101. ​In this online course you'll learn: cause marketing, board recruitment, partnerships, and revenue diversification. PUR: 601 Grant and Bid Proposals. 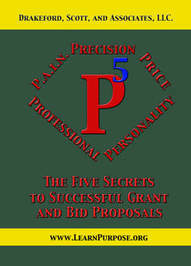 ​Learn from 40 years of experience, Learn the Five Secrets to Successful Grant and Bid Proposals. PUR: 602 Filing Form 1023-EZ for 501 (c)3 Nonprofit Status. ​Learn how to file your nonprofit federal form 1023 online in 1 hour. ​Learn your best test strategy, GRE test secrets, and how to reduce stress and increase confidence. This course includes a book. PUR: 511 Creating and Inclusive Classroom. ​In this hybrid professional development course for teachers, you'll learn strategies to teach diverse students.